There were other families. People with surnames like Casey, Livingston, McDonald, and Terry. But Sarah Louise O’Brien and Bryant Lovin had eyes only for each other. Their parents may have tried to dissuade them. They probably shared some mutual interests. One thing they definitely shared was a grandfather. And as the old saying goes: Where there’s a will… (this week’s prompt). Laurence O’Brien (1720-1812) and his wife Frances (b. abt. 1725), my sixth great-grandparents, immigrated to America around 1740, probably because of the famine in Ireland. They eventually settled in a little community called Beaver Dam in Anson County, North Carolina, around 1750. Their children were born in North Carolina. Laurence was one of the signers of a petition in 1777, requesting the formation of a new county in the eastern part of Anson County to facilitate easier access to a county seat for doing business. That division became official in November 1779, and travel distance to the new county seat (Rockingham in the new Richmond County) was reduced from twenty-four miles to seven. Yes, Bryant and Sarah (my fourth great-grandparents) were first cousins—and they started a trend! The next Lovin/O’Brien cousin marriage took place between Dennis O’Brien (1819-1886) and Martha Jane Lovin (1829-1903). Dennis is the son of my fourth great-grandparents John J. O’Brien and Zilpha Casey (1792-1855), and Martha is the daughter of my fourth great-grandparents William Lovin and Elizabeth Livingston (1802-1884) (whose son William Richmond Lovin also named his daughter Martha Jane Lovin). Dennis and Martha are second cousins and my third great-grandparents. Dennis was the one who helped build Green Lake Church. Another first-cousin marriage was between Sarah M. O’Brien (1855-1880) and Nathan W. Gibson (1851-1918). Sarah is the daughter of John J. O’Brien’s son William Wesley O’Brien (1821-1888) and Anna Elizabeth “Eliza” Wright (1825-1864), while Nathan is the son of John J. O’Brien’s daughter Martha O’Brien (1814-1878) and Nathan B. Gibson (1796-1857). James William “Jimmy” O’Brien (1850-1929), son of Dennis and Martha O’Brien, married Martha Jane Lovin (1851-1922), daughter of Bryant and Sarah Lovin’s son Quincy Lafayette Lovin (1828-1898) and Nancy Webb (1825-1892) (my third great-grandparents). Jimmy and Martha are my second great-grandparents (their daughter Lula is my great grandmother). Notice that Jimmy’s wife has the same name as his mother: Martha Jane Lovin. The two women are first cousins, once removed. Frances Ann Lovin (1844-1920), daughter of Bryant and Sarah Lovin’s son William R. Lovin (1812-1882) and Sarah B. Watson (1817-1910), married Jehu Thomas Gibson (1840-1915), son of Nathan and Martha Gibson. Ada Lilly Gibson (1882-1954), daughter of Nathan W. Gibson and Rosa John Gale (1863-1928), married Winston B. Webb (1880-1946), son of Dennis and Martha O’Brien’s daughter Virginia O’Brien (1854-1924) and Louis H. Webb (1847-1922). It wasn’t uncommon in the early years of our country for cousins to marry each other. Unrelated people may have lived a day’s journey away, while family was much closer. And even if unrelated people lived nearby, there was no guarantee there would be an available partner. It wasn’t until the end of the 19th century that my O’Brien relatives stopped marrying each other. 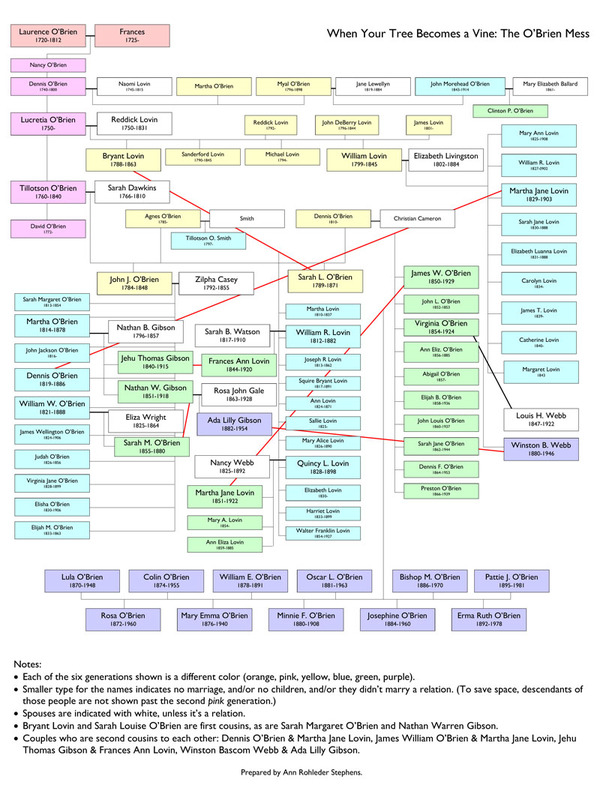 O’Brien Family Tree showing intermarriages. Click here for a PDF. A while back I tried to map out the O’Brien family tree without repeating any names. Rather than the type of tree everyone is used to, I listed Laurence and Frances’s children one on top of each other down the left side of the page and spread the grandchildren out to the right. The fourth generation is listed in three different columns with the fifth generation in columns between them. Most of the sixth generation is at the bottom. Cousin marriages are indicated with a red line. Each generation is a different color to make it a bit easier to follow. However, it’s still a mess. All of this…mess…is what led to the name of my blog. It’s not a tree, folks; it’s a leafy vine! This entry was posted in 52Ancestors, Casey, Dawkins, Gibson, Livingston, Lovin, O'Brien, Webb. Bookmark the permalink.